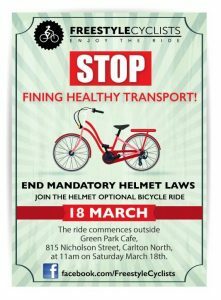 Freestyle Cyclists are holding a helmet optional protest ride – “Stop Fining Healthy Transport”. We have liaised with the police, and registered the ride with them. At this stage they have not expressed an interest in attending. We do not anticipate any action being taken against those who choose not to wear a helmet but we can’t guarantee that police patrols will not take an interest in us in the course of their normal duties.